This soft skirt champ dress beautifully combines modern style with traditional colors and intricate embroidery. The bodice is bottle green velvet with a rich sheen plus embroidery in pale yellow and pale green. 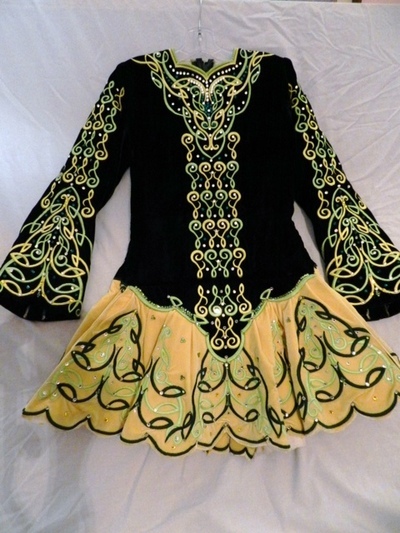 The skirt is butter yellow velvet with emerald green and pale green embroidery. Hundreds of crystals in clear, citrine, peridot and emerald. Soft cape, cotton bloomers, and matching crystal & velvet headband all included. Good used condition, no odor. Can be shortened or lengthened easily at skirt seam. Shoulder seam to shoulder seam across upper back: 14 in. Asking Price: $US900. Shipping costs are included for my own country, overseas shipping is extra. Returns are negotiable.